When the combined armies of Zorg are firing photon weapons at you, 5 kilograms doesn’t seem like much. 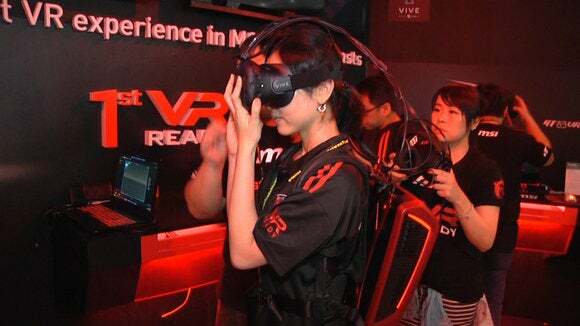 Even the cables and straps that are a necessary part of MSI’s Backpack PC fade into the background when you’re immersed in a virtual reality game. 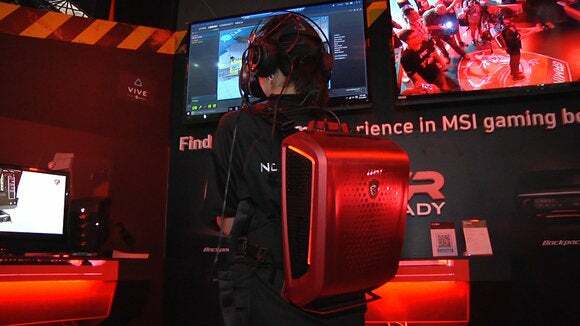 That’s what I discovered when I took MSI’s new Backpack PC for a test spin on Wednesday at Computex in Taipei. 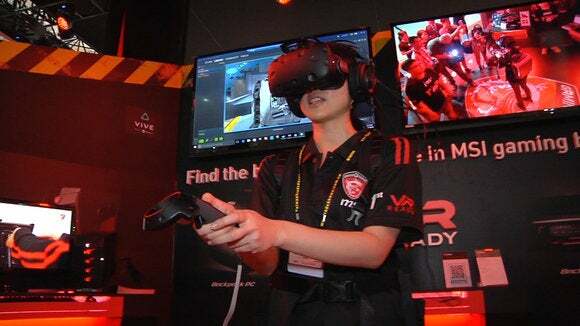 The device is an entire gaming PC built into a backpack that allows for completely untethered virtual reality gaming. Current VR games run on a computer that sits on a desk or floor and stubbornly won’t move as you jump around in a virtual world. It means long cables are needed and that can be a hazard and a hassle. With the Backpack PC the cables aren’t completely gone, but they are shorter and don’t get in the way. The whole ensemble looks like the kind of thing James Bond might slip on to go scuba diving. Slip on the backpack, then the virtual reality headset, the headphones and finally pick up the controller and you’re ready to do battle. At Computex, I had two MSI employees help me put it on, but it’s not the kind of thing you really need help with once you know what you’re doing. The Backpack PC was running a demonstration game that involved small round spaceships coming towards me from all directions. If I didn’t blast them with my laser weapon fast enough, they’d emit little energy balls that would drift towards me. I couldn’t blast those and had to jump to avoid them hitting me. If one got to me, it was game over. Game over happened a lot. In part it was because I was scared to jump around. I didn’t feel comfortable moving around freely in the new space because I feared bashing into things. It’s certainly something that will be easier at home although it’s really easy to become disoriented. MSI’s Backpack PC during a demonstration at the Computex trade show in Taipei on June 1, 2016. But the overall experience was a lot of fun. Helped by the rich graphics that are the result of using a high-power gaming laptop and the HTC Vive headset, it was easy to forget about all the gear I was wearing—even if I couldn’t forget the walls and desks around me. And as I took it off, I realized that’s perhaps the key thing for any piece of VR gear. If the image is good enough and the content engaging enough to allow you to immerse yourself, then the rest of it doesn’t matter too much. MSI says the Backpack PC will be available in the second half of this year but there aren’t any more details. An MSI employee told me the specifications and design are likely to change—this isn’t the final commercial version—so the company isn’t saying anything more about when or where it will launch or how much it will cost.